Dario Meets Man’s Best Friend | Marbella Marbella – Adelante! Last month I was deeply affected by the touching poem attributed to Wolfie, written by David the Dogman to Sandy & Ross in memory to their beautiful dog. It brought home to me just how wonderful our canine friends are, and how much we rely on them. So inspired by this idea, I thought a written tribute to them all, was in keeping. I have always associated myself with dogs (of the animal kind) – perhaps it’s due to my Chinese Astrological birthday that places me squarely as a dog sign. This plain fact, I’m reliably told by those who presume to understand me, explains the loyalty and defensiveness of my character when protecting my friends. I consider it to be an honour to be placed in the same high category as the canine species. 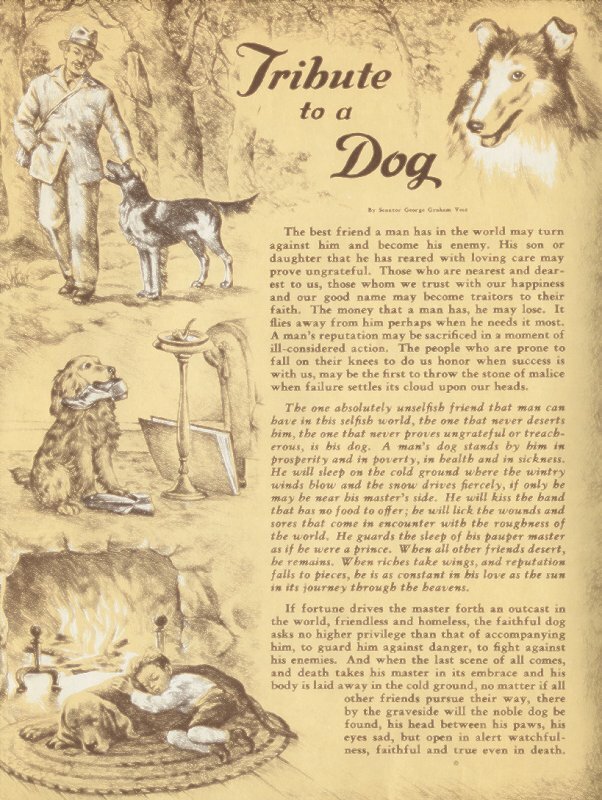 I was reinforced in my opinion of dogs when I discovered an invaluable piece of writing by an American Senator Vest of Missouri, when he heroically defended a dog who was about to be sent to the dog home in the sky. Here is his moving defence of his doggy friend. “Gentlemen of the Jury: The best friend a man has in the world may turn against him and become his enemy. His son or daughter that he has reared with loving care may prove ungrateful. Those who are nearest and dearest to us, those who we trust with our happiness and our good name may become traitors to their faith. The money that a man has he may lose. It flies from him, perhaps when he needs it most. A man’s reputation may be sacrificed in a moment of ill-considered action. The people who are prone to fall on their knees to do us honour when success is with us may be the first to throw the stone of malice when failure settles its cloud upon our heads. The one absolutely unselfish friend that man can have in this selfish world, the one that never deserts him, the one that never proves ungrateful or treacherous, is his dog. A man’s dog stands by him in prosperity and poverty, in health and in sickness. He will sleep on the cold ground where the wintry winds blow and the snow drives fiercely, if only he may be near his master’s side. He will kiss the hand that has no food to offer; he will lick the wounds and sores that come in counter with the roughness of the world. He guards the sleep of his pauper master as if he were a prince. When riches take wings and reputations fall to pieces, he is constant in his love as the sun in its journey through the heavens. If fortune drives the master forth as outcast in the world, friendless and homeless, the faithful dog asks no higher privilege than that of accompanying him, to guard against danger, to fight against his enemies, and when the last scene of all comes and death takes the master in it’s embrace and his body is laid in the cold ground, no matter if all other friends pursue their way, there by the graveside will the noble dog be found, his eyes sad between his paws, his eyes sad, but open in alert watchfulness, faithful and true even in death”. After the senator’s moving testimony and defence of the accused dog, delivered in a low voice, without any gesture, the judge and jury were wiping their eyes. The jury returned the verdict in favour of the plaintiff and the dog was freed.